Los Cabos, a place for the whole family. Cabo is considered to be one of the most beautiful places in North America. It is well known for its arch, spectacular beaches, and turquoise water. It is also known for its fishing, golfing, activities, dining and nightlife. With time Cabo has built its reputation for being very safe and family-friendly. So many things to do in Los Cabos for families – so little time! Our suggestion of exciting things to do in Los Cabos with your family. Family-friendly Cabo Escape boat sailing from Cabo San Lucas in Baja California Sur, Mexico. Several Los Cabos activities companies offer daily outings for snorkeling. Children of all ages are invited to go with Cabo Escape on its snorkeling tour to Chileno or Santa Maria Bay. The tours include all snorkel gear, drinks, breakfast or lunch. If you are looking for some real fun under the sun then consider booking a family lunch or dinner aboard this great catamaran. The Mexican-style buffet and open bar will keep everyone happy. To really crank it up just hit the dance floor and work off the extra energy. Another amazing adventure is the famous Cabo Legend Pirate Ship. It’s a must do with kids! This 100-foot twin masted brig wooden sailing ship is the best Pirate experience in Cabo. This is a real quality time for the whole family. You will share memories that will last a lifetime. It’s fun, interactive and lots of laughs. To experience the magic of the open sea with the little ones we highly recommend you try Cabo Sailing. They offer tours open to the public as well as private charters. You can customize your family experience: go snorkeling at the beach of your choice, enjoy the amazing sunsets of Cabo, order the food of your favorite restaurant or do whatever you feel like during the hours of your private charter. Their highly trained crew will take extra steps to ensure the children safety. 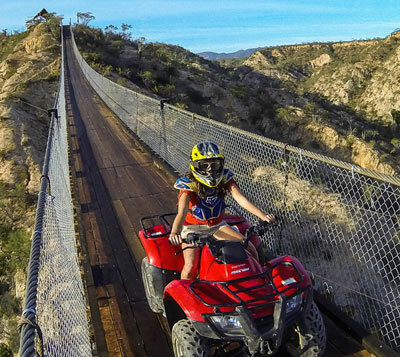 ATV crossing Los Cabos Canyon Bridge in Wild Canyon Adventures Park. The tour takes you from the heart of the desert to the beach passing through the longest suspension bridge of its kind in the world! Eco-friendly and known for its preservation work, Cabo Expedition has a variety of family activities to offer. Go on the Cabo Submarine and experience the marine world of the Sea of Cortez without getting wet. Their knowledgeable staff will be informing you about all the marine species that you’ll encounter during this tour. With Cabo Expedition you can also go on a Glass Bottom Kayak and Snorkeling Tour or see the Medano Beach and the Arch from the air doing Parasailing. Aside from all the water activities, there are many things that you and your family can do on land. The biggest adventure park in the area is the Wild Canyon. This impressive and beautiful property has a great selection of tours and adventures. From the high adrenaline ones like the Zip Lines, Sling Swingers and Bungee Jumping to the ATVs and Camel Rides. Yes, you heard correctly, Camel Rides – the kids favorite! Most of the camels were trained to work with the kids. It’s safe, it’s fun and the whole family will have a time of their life. Aside from that, you can check the Wild Canyon’s Kingdom. Interact, feed, pat and play and with many different animals and birds that have been rescued by the Wild Canyon team. These are just some of the fun and exciting things to do in Los Cabos for Families. Los Cabos Passport can direct you where all the best action is and help you save half on everything.